The summer hiking season is approximately 180 days. Of these, about 70 days are bad weather. Most shuttle companies cancel when the weather is bad. It can snow on the Crossing in the middle of summer. Strong winds and cool temperatures are common. The forecast can be wrong. The actual weather can change quickly from a good day to a bad day and vice versa. There are many different weather outcomes and this is why it is important to prepare well. The Tongariro Alpine Crossing one day hike. The Tongariro Alpine Crossing is 19.4 km and passes through an alpine environment. The total climb from the Mangatepopo start to the top of Red Crater (the high point of the track) is 766m. The descent is about 1126m. The average walking time including stops and photos is about 8 hours. The fitter you are the easier the hike will be. The same applies with the weather. The fitter you are the easier it will be to deal with high temperatures or cold and wet weather. The weather on the Crossing can make for a beautiful day out. It can also turn a moderate hike into a survival test. Knowing your fitness level and your limits is important when making your decision to hike if the weather is marginal. If you take only one thing from this post, know this. You can have a great Tongariro experience even if the weather is too bad to hike the Crossing. The Tongariro National Park is a lot more than the Crossing. I can’t stress this enough! There is an abundance of natural beauty and adventure in and around the Tongariro National Park. Which means it is easy to plan alternatives. The Crossing takes you up to almost 1900m above sea level. The weather lower down is often better. At the lower altitudes there are stunning day hikes, beautiful shorter hikes and mountain biking for all levels of ability. There is also river rafting. And many other alternatives. Most alternatives don’t need a booking. So just having a list of other adventure you'd like to do is enough. Scheduling only one day for the Crossing is risky. Especially when you consider more than 1 in 3 days are horrible weather. If you've travelled half way around the world for this hike it’s a good idea to give yourself the best chance of doing it. Two days should be the minimum. Three even better if you have the luxury. If the weather if fine for your entire stay you can enjoy other adventures on your list of alternatives. A tip for those travelling in the afternoon after finishing the Crossing. Start the hike early so you don’t need to rush your afternoon travels. Especially if you are driving to Wellington or Auckland. There are many towns to choose from to stay the night before your hike. If you stay close to the start of the Crossing you will see what the weather is doing before you head out. This can be helpful when making a decision when the forecast is marginal. You can see the weather from Whakapapa Village and National Park Village. From Taupo, Turangi, Ohakune you can't see what’s happening until you travel to the Crossing. If the forecast is bad it's easier to make a decision if you can see the weather for yourself. The actual weather might be worse than forecasted or it could be better. You won’t know this for yourself if you are staying further away from the start. The weather can change quickly so be cautious about making your decision solely on what the weather is doing in that moment. Talk with a local mountain expert so you can make an informed decision. Another reason to stay close is so you can put Plan B into action if the Crossing is not an option due to bad weather. You can start exploring the Tongariro National Park immediately depending on where you stay and what your Plan B is. 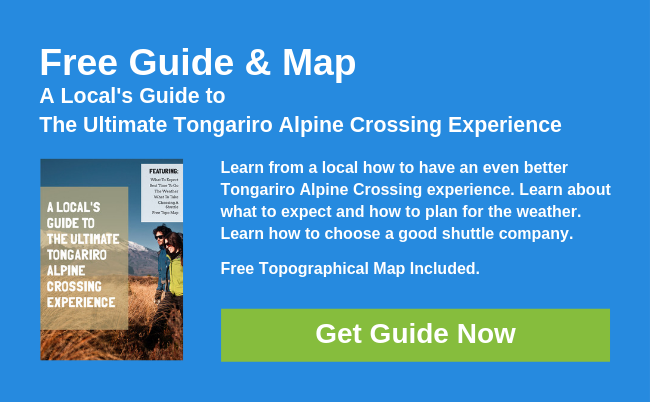 There are many shuttle companies operating to and from the Tongariro Alpine Crossing. 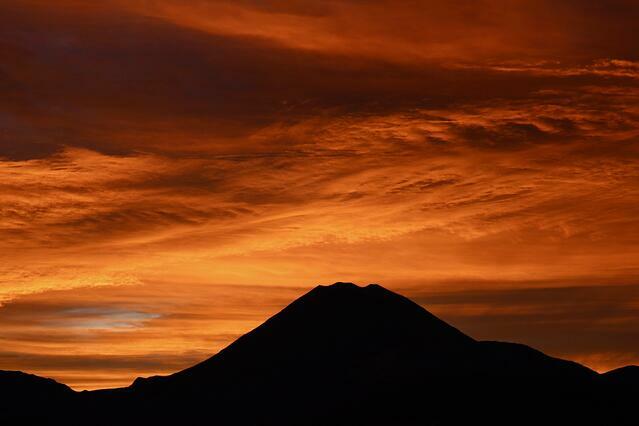 It’s important you choose a quality operator so your Tongariro experience is the best it can be. This is critical if the weather is bad or marginal. Choose a shuttle company which allows you to cancel at anytime for a full refund so you don’t feel pressured to go. Choose an experienced shuttle company who can give good advice about the weather conditions. And finally choose a company who cares about your safety and enjoyment. A word of warning about the forecast: It can be completely wrong! The weather can turn out worse than forecasted, or better. The Metservice Tongariro forecast shows weather predictions for up to four days into the future. Another word of warning, the forecast can change drastically during those four days especially if the weather pattern is unstable. The forecast can also change drastically from one update to another. For this reason it’s critical to prepare for all weather. Which means packing sunscreen on cold rainy days and packing a quality rain jacket and warm layers on hot sunny days. The weather forecast can be challenging to understand and interpret. It can be wrong. If you are unsure about the weather forecast find a local mountain expert who can help you. A local expert can help you make an informed decision on whether to hike or not when the forecast is marginal or bad. It could be the bar owner who’s spent much of his life in the area. It could be the hotel manager. It could be the bus driver who know’s the mountain like the back of her hand. Find someone who has local mountain experience. The local i-Sites can be a good source of information but be aware not all i-Site staff will have experience in the mountains or on the Tongariro Alpine Crossing. The i-Sites will generally be cautious when giving advice about the weather. It is not uncommon for i-Site staff to tell visitors the Crossing is closed for the next day when the forecast is marginal. There are two problems with this. The first problem is the forecast could change for the better over night and actual weather could turn out better than forecasted. The second problem is this information is not correct as the Crossing does not close due to bad weather. Most shuttle companies will not operate when the weather is dangerous and you should not attempt it on such days, but the Crossing does not close. Weather can be subjective. What’s marginal weather for one person might be OK weather for the next person. It depends on your level of mountain experience and the quality of your gear. Marginal weather can be dangerous weather if you don’t have the correct gear. Generally, shuttle companies will operate when the weather is marginal. A good shuttle company will advise of the marginal weather so you can make an informed decision. They will refuse to take you if your gear is unsuitable for the conditions and recommend alternatives for the day. The main reason a shuttle company will cancel their service is when winds are forecasted to be over 65km/h. The Red Crater, the high point on the Crossing is relatively narrow and exposed to the winds. It can be dangerous attempting Red Crater in high winds. Good shuttle companies will cancel for other weather reasons also. As already stated the forecast can be wrong. The weather can be better or worse than forecasted. It’s a good idea to make your decision in the morning before you’re scheduled to hike. Your shuttle company will give you the latest forecast. If you are staying close you will see what the weather is doing. By leaving your decision until the morning of your hike you’ll make a better informed decision. Once again, if you’re unsure talk with a local mountain expert. If the forecast for the next day is for bad weather they might tell you to sleep in. Or they might tell you there’s a chance the weather will be better than predicted so get up early and be ready. If the forecast is for marginal weather it is important to consider your level of experience and the quality of your gear. Can you comfortably make it over the Crossing safely if the weather becomes worse than forecasted? Will you enjoy it if the weather is poor? Would you have a better day doing an alternative adventure? The Crossing is a magnificent hike, but you shouldn’t do it just to tick it off your list. If you feel uncomfortable about the weather forecast or have doubts about your ability or gear you should not attempt the Crossing. If you have booked with a shuttle company who will not refund your ticket so be it. Don’t let money influence your decision. Be sensible and safe so you can enjoy the day. If the forecast is for good weather on your day that’s magnificent! You'll still need your rain jacket and warm layers just in case. And sun protection. A tip for the warmer months; if you start early you can complete all or most of the climb to the high point before the heat of the day kicks in. Prepare well and your Tongariro Alpine Crossing adventure can be a great experience no matter what the weather does. Give yourself the best chance of doing the hike by scheduling back up days. Find a local mountain expert for advice if the forecast is not looking good. Have a list of alternatives ready just in case. Come with a good attitude and the right gear and you’ll leave with happy memories.